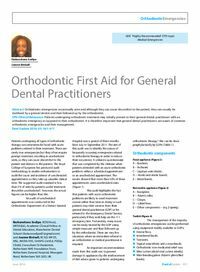 Abstract: Orthodontic emergencies occasionally arise and although they can cause discomfort to the patient, they can usually be stabilized by a general dentist and then followed up by the orthodontist. Clinical relevance: Patients undergoing orthodontic treatment may initially present to their general dental practitioner with an orthodontic emergency as opposed to their orthodontist. It is therefore important that general dental practitioners are aware of common orthodontic emergencies and their management. Author notes: Ibukunoluwa Sodipo, BDS(Hons), MFDS(Ed), Academic Clinical Fellow in Dental Education, Manchester Dental School (ibukunsodipo87@gmail.com) and Joanne Birdsall, BChD, MFDS, MSc, IMOth FDS, OrthPG CertEd, PGDip ClinEd, Consultant Orthodontist, Rotherham NHS Foundation Trust, Rotherham General Hospital, Moorgate Road, Rotherham S60 2UD, UK. Objective: To understand the management of common orthodontic emergencies.